For the Marine dead of all wars, and their comrades of other services who fell fighting beside them. Mount Suribachi on Iwo Jima. 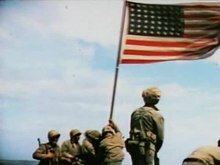 A portion of the color film shot of the second flag-raising on Mount Suribachi by Sgt. Bill Genaust, USMC, excerpted from the 1945 "Carriers Hit Tokyo" newsreel. De Weldon's remarks at the 1954 dedication of the Memorial. The centerpiece of the memorial is a colossal sculpture group depicting the six Marines who raised the second (and larger) replacement U.S. flag atop Mount Suribachi on February 23, 1945. They were Marine Sergeant Michael Strank, Corporal Harlon Block, Private First Class Rene Gagnon, Private First Class Ira Hayes, Private First Class Harold Schultz, and Private First Class Franklin Sousley. 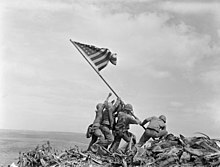 The flag-raising also was recorded by Marine Sergeant Bill Genaust, a combat motion picture cameraman, who filmed the event in color while standing beside Rosenthal. Genaust's footage was included in the 1945 newsreel "Carriers Hit Tokyo," and established that the second flag raising was not staged. He was killed by the Japanese after entering a cave on Iwo Jima during the battle. Genaust's remains have never been found. The commission for the memorial was awarded in 1951. De Weldon spent three years creating a full-sized master model in plaster, with figures 32 feet (9.8 m) tall. This was disassembled like a giant puzzle, and each piece was separately cast in bronze. Peaslee's base for the memorial is made of black diabase granite from a quarry in Lönsboda, a small town in the southernmost province of Sweden. It features a number of inscriptions. Groundbreaking was held on February 19, 1954. Construction of the memorial began in September. The bronze pieces of the sculpture were assembled to Brooklyn, New York for casting in bronze. This took about 3 months to complete. After that, they were reassembled into a dozen pieces and were shipped back to Arlington, Virginia in a 3 truck convoy, to which was added a 60 feet (18 m) flagpole. The total cost of the memorial was $850,000, including the development of the site. It was paid for with donations from U.S. Marines, former Marines, Marine Corps Reservists, friends of the Marine Corps, and members of the Naval Service; no public funds were used. The memorial was dedicated on November 10, 1954, the 179th anniversary of the founding of the Marine Corps. The Presiding officials included President Dwight D. Eisenhower, Vice President Richard Nixon, Deputy Secretary of Defense Robert Anderson (Honorary Chairman of the Day), Assistant Secretary of the Interior Fred G. Aandahl, and sculptor Felix de Weldon. Speeches were given by Richard Nixon, Robert Anderson who dedicated the memorial, Felix de Weldon, and General Lemuel Shepherd, 20th Commandant of the Marine Corps who presented the memorial to the American people. In 1961, President John F. Kennedy issued a proclamation on June 12 that a Flag of the United States should fly over the memorial 24 hours a day, one of the few official sites where this is required. Despite being mounted on the staff of the sculpture, which depicts an event that occurred when the U.S. flag had 48 stars, the flag used is a modern one (specifically, one featuring the number and arrangement of stars prescribed as of when the flag is being flown) in keeping with both the text of the proclamation and the memorial's dedication to all Marines who died in defense of the United States regardless of when their deaths occurred. The memorial is located on a high ridge, overlooking the national capital. The Marine Barracks, Washington, D.C. uses the memorial as the centerpiece of its weekly Sunset Parade, featuring the Drum and Bugle Corps and the Silent Drill Platoon. The identities of the six Marine flag raisers depicted on the memorial. Left to right: Ira Hayes, Harold Schultz, Michael Strank, Franklin Sousley, Rene Gagnon, and Harlon Block. The memorial consists of front and rear inscriptions, and inscribed in gold letters around the polished black granite upper base of the memorial is the date and location of every United States Marine Corps major action up to the present time. Front (west side): "Uncommon Valor Was A Common Virtue" – "Semper Fidelis"
Rear (east side): "In Honor And Memory Of The Men Of The United States Marine Corps Who Have Given Their Lives To Their Country Since 10 November 1775"
Felix de Weldon's and Joe Rosenthal's names are also inscribed on the bottom left and bottom right base of the front side of the memorial. Rosenthal's name was added in 1982. "Dedicated To The Marine Dead Of All Wars, And Their Comrades Of Other Services Who Fell Fighting Beside Them. Created By Felix De Weldon, And Inspired By The Immortal Photograph Taken By Joseph J. Rosenthal On February 23, 1945, Atop Mt. Suribachi, Iwo Jima, Volcano Islands. Erected By The Marine Corps War Memorial Foundation, With Funds Provided By Marines And Their Friends, And With The Cooperation And Support Of Many Public Officials. A persistent rumor has attributed the existence of a thirteenth hand from the six statues of the men depicted on the memorial and speculation about the possible reasons for it. When informed of the rumor, de Weldon exclaimed, "Thirteen hands. Who needed 13 hands? Twelve were enough." In the siting controversy for the U.S. Air Force Memorial, originally to be near de Weldon's work, J. Carter Brown (in 1998, chairman of the United States Commission of Fine Arts) described the Marine Corps Memorial as, "I would say that the Iwo Jima memorial is kitsch. It was taken from a photograph, it is by a sculptor, even though he was a member of this commission at one point, who is not going to go down as a Michelangelo in history—and yet it is very effective, largely because of its site." This remark was met with calls for Brown's resignation from the commission, and disagreement over the categorization from the commission's staff. On April 29, 2015, philanthropist David Rubenstein pledged over five million dollars to refurbish the memorial in honor of his father, a Marine veteran from World War II who died in 2013, "and all Marines who have died in service to the United States." The $5.37 million donation, made through the National Park Foundation, supported cleaning and waxing the statue, polishing the black granite panels, regilding inscriptions, relandscaping, and making repairs to the pavement, lighting and flagpole. While the Park Service performs regular routine maintenance, this was the first comprehensive refurbishment of the memorial since its dedication in 1954. The work was done in three phases with completion in 2018. When there were no government funds for sculpture during the war, the sculptor financed a concrete version of similar design in a one-third size that was placed on a parcel of land in Washington, D.C. until 1947, when it was put into storage. It later was restored and displayed at a museum on an aircraft carrier and again, returned to storage. This small concrete statue of the second U.S. flag raising at Iwo Jima in 1945 was scheduled to be auctioned in February 2013 at a New York auction dedicated to World War II artifacts, but it failed to receive the minimum bid required for the auction of it to begin. The original plaster working model for the bronze and granite memorial statue currently stands in Harlingen, Texas at the Marine Military Academy, a private Marine Corps-inspired youth military academy. The academy also is the final resting place of Corporal Block, one of the flag raisers who was killed in action on Iwo Jima. A small model stands in the lobby of Spruance Hall, U.S. Naval War College, Newport, Rhode Island. It was presented by the sculptor, a resident of Newport. There are scaled-down replicas at three Marine bases: just outside the front gate of Marine Corps Base Quantico in Virginia, adjacent to the parade deck at Marine Corps Recruit Depot Parris Island in South Carolina, and just inside the main gate at Marine Corps Base Hawaii in Kāne'ohe Bay, Hawaii. On 18 May 1973, a bronze relief of the memorial was placed along Cedar Point Road near St. Nicholas's Chapel at the Patuxent River Naval Air Station in Maryland. A version of the memorial dedicated in commemoration of the fiftieth anniversary of World War II stands in the Knoebels Amusement Resort in Elysburg, Pennsylvania. A similar design is used for the National Iwo Jima Memorial in Newington, Connecticut, which was dedicated in 1995 to the 6,821 U.S. servicemen who died in the battle. A copy was dedicated at Fall River's Bicentennial Park, along the banks of the Taunton River, in Massachusetts in 2005. A plywood cutout version is found along Highway 62 ca. 17 miles from the center of Twentynine Palms, California. The 5th Marine Division Memorial, at the U.S. flag-raising site on Mount Suribachi, Iwo Jima. Marine Corps Memorial, Marine Corps Base Quantico, Virginia. Iwo Jima Memorial, Marine Corps Recruit Depot Parris Island, South Carolina. Pacific War Memorial, Marine Corps Base Hawaii. Iwo Jima Monument (1982), Marine Military Academy, Harlingen, Texas. Sculptor Felix de Weldon with his master model. Wikimedia Commons has media related to Marine Corps War Memorial. ^ a b "Memorial honoring Marines dedicated". Reading Eagle. Pennsylvania. Associated Press. November 10, 1954. p. 1. ^ "Arlington Ridge Park – George Washington Memorial Parkway". National Park Service. October 31, 2017. Retrieved April 11, 2019. ^ http://www.gemeneman.se/MinSommar2005.pdf (in Swedish) Translation, page 3 line 28-29: The most famous war memorial in the United States, U.S. Marine Corps Memorial in Washington D.C., stands on a base in granite pieces from Hägghult. Hägghult is the name of the quarry, just outside Lönsboda. ^ "Permanent flag ordered". Kentucky New Era. Hopkinsville. Associated Press. June 13, 1961. p. 3. ^ Kelly, John (February 23, 2005). "One Marine's Moment". The Washington Post. Washington, D.C.: The Washington Post Company. p. C13. ISSN 0190-8286. Archived from the original on September 18, 2012. Retrieved 2008-07-13. ^ "Iwo Jima memorial called 'kitsch'". Deseret News. 8 March 1998. Retrieved 20 March 2014. ^ Ruane, Michael E. (April 29, 2015). "Billionaire David Rubenstein gives $5M to refurbish Iwo Jima sculpture". Washington Post. Retrieved 30 April 2015. ^ Zongker, Brett (29 April 2015). "Marine Corps Memorial to be restored after $5.4M donation". The Associated Press. Retrieved 1 May 2015. ^ "U.S. Marine Corps War Memorial Rehabilitation - George Washington Memorial Parkway (U.S. National Park Service)". www.nps.gov. Retrieved 2019-01-10. ^ "Original Iwo Jima monument could fetch up to $1.8M at NYC auction". Fox News. Retrieved 8 February 2013. ^ "Iwo Jima Memorial". SWFL Art & Community Theater. Retrieved 17 September 2015. Many think that it is a replica of the 60-foot-tall Iwo Jima Memorial near Arlington National Cemetery in Virginia, but it is, in fact, one of three originals that were created by a sculptor by the name of Felix de Weldon. ^ Daley, Lauren (7 November 2005). "Iwo Jima monument graces Fall River". South Coast Today. Retrieved 31 August 2017. Historic American Landscapes Survey (HALS) No. VA-9, "United States Marine Corps War Memorial, Marshall Drive, Arlington, Arlington County, VA"